As well as algorithmic penalties, some penalisation of websites is carried out manually. This guide will help you identify algorithmic and manual penalties and suggest steps for penalty removal. A Manual Action will often result in a noticeable deterioration in a site’s performance in the SERPs. You may also notice that the site or particular pages on the site no longer appear in search results. 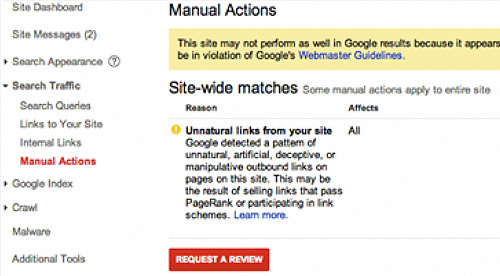 If you think your site may have received a manual penalty you can check this in Google Webmaster Tools. The degree to which the performance of your site is affected will depend on the type of penalty you have received. Site-wide matches – these are Manual Actions that affect the entire website and are sometimes also known as ‘full manual penalties’. Partial matches – these are Manual Actions that affect individual URLs, individual pages or sections of a site. These are sometimes known as ‘partial manual penalties’. Click on ‘Site Messages’ in the left hand side menu. Click on ‘Search Traffic’ in the left hand side menu. If you need to remove a Manual Action from your website you must follow a set process. What is Manual Penalty Removal and why has it become important in recent years within SEO? Google’s approach to spammy link building tactics has become pretty aggressive in recent years and part of its war against black hat SEO activity has been to place ‘Manual Actions’ or ‘Manual Link Penalties’ on websites that show clear signs of breaching webmaster guidelines in this respect. What are your recommendations around this in successfully revoking a manual penalty? 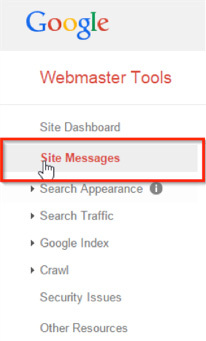 For those of you who are working on websites that have received such actions via your Webmaster Tools messages, you’ll know that it can be pretty tricky to get that penalty lifted. We are going to give you a quick step-by-step run down to explain how the team here at Jellyfish has dealt with such issues and hopefully provide you with a few easy-to-follow rules that you need to consider to up your chances of getting the penalty revoked. Tell us about the link discovery process. Why is it so crucial to removing the penalty? First up - Link discovery. The idea is that if you can see all of the links pointing to your profile, you can begin to understand which ones are good or bad – and which need to be ditched. Falling short with your link discovery is a sure way to fail in removing a manual link penalty. If you don’t identify all, or as many of, the links within your website’s backlink profile all of the subsequent actions that you take in attempting to remove a manual penalty are likely to reap little benefit. The problem is that different link discovery tools seem to unearth varying parts of your link profile. Few seem able to present a definitive, complete list. For example, a download of links from Google Webmaster Tools may provide a slightly different batch of links than a download from Ahrefs Backlink Checker. For this reason, here at Jellyfish we use a wide variety of backlink discovery suites so that, when the output from each is combined, we can be pretty confident that the vast majority of existing backlinks has been obtained. Do all link tools show the same volume of links? What tools are recommended for this process? What is link classification and is it a time consuming process? Once you’re happy that you’ve discovered all of the links within your website’s profile, the next step is to classify them. The aim here is to select and shortlist the links that you feel need to be removed in order to lift the manual penalty and make the overall link profile more natural. Essentially, we are looking at removing any links that have been suspiciously acquired. Depending on the size of your link profile, this may be a fairly hefty task and – yup, you've guessed it – it really needs to be a predominantly manual process to ensure that each link is assessed accurately. That said, we often recommend using a link classification tool such as the one provided by CognitiveSEO to get a head-start or to at least create an initial split between what is seen as ‘Natural’, ‘Suspicious’ and ‘Unnatural’. How aggressive should you be in your classification? You should be very aggressive. We say this because many people, particularly when first dealing with a manual penalty, will try the ‘slowly slowly’ approach and aim to remove just one or two suspicious links at a time in the hope that this will tip the balance and remove the Manual Action by Google. In doing so, they’ll often remove the links which are the most obvious offenders but leave a stack of other unnatural links in the hope that Google can’t identify them as being manipulated. This is a bad move and is likely to prolong the penalty. Just be aggressive, or maybe a better word is ‘honest’. What metrics do you use to identify a good or bad link? We suggest concentrating on authenticity rather than a million different metrics. In link analysis it is sometimes easy to become obsessed with metrics such as Domain Authority or PageRank, but the important thing here is to focus on whether you feel the links are ‘real’ or not. Was it naturally acquired due to a user genuinely engaging with your brand, products or services? Or was it purely created as part of a rough-house link building tactic purely to boost your keyword rankings? If it is the latter, then chances are that you’ll need to consider removing it or assessing it more closely. Shortlist links from spammy SEO-driven directories as ‘unnatural’. Prepare to remove links that have been built on article farms and networks. Consider removing links from sites that are irrelevant and in no way related to your business sector. Assess and be very cautious of backlinks within blog-rolls or footers, particularly from Web 2.0 properties. Shortlist exact-match links for removal or amendment. Google has been heavily scrutinising exact-match anchors and this is seen as a tell-tale sign of over-optimisation. As such, deal with these types of links with great attention. Assess any links that have been acquired on high-quality sites through paid means and, if authentic, ensure that they are ‘no-follow’. Of course its ok to have links that have been acquired through commercial means on reputable, relevant sites, but if they’ve been paid for or negotiated for then they are essentially a means of advertising and, as such, ought to be no-follow. Now you’re ready to begin your manual outreach process, where you’ll contact the webmasters of offending referring domains and request that they either remove or amend the backlinks that are pointing from their site to yours. What is manual link amendment? The idea of the manual outreach process, in respect to penalty rectification, is to contact the webmasters of sites that are unnaturally linking to yours and to request that they remove these links. If you wish to maintain a link but simply change it to no-follow, this is also done within the outreach process. It’s a simple but often tedious and time-consuming task. The important thing, however, is to ensure that you keep a formal record of who you contacted, what the details were that you used, the date that you made your approach and the outcome of your request. These details are best kept in a spreadsheet. At Jellyfish we like to use a Google Doc so that it can easily be shared with the Google Spam Team at a later stage within the penalty removal process. What is the typical success rate around manually requesting that links are removed? You have to bear in mind that a lot of the webmasters you will be contacting may be overwhelmed with requests from others in a similar position to yourselves. For this reason, it may take several attempts to get a response from them. In many scenarios you won’t hear anything back at all. Don’t get disheartened though. In many cases we only see a 10 – 15% success rate in manual link removal, but it is still worth the effort and certainly important in demonstrating to Google’s Spam Team that you have taken your link rectification process seriously and gone to extensive efforts to clean things up. So what happens to the unwanted links that you simply can’t remove manually? You can get them disavowed. What exactly is the Disavow Tool and how do I access it? Google’s disavow tool enables you to deal with links that you are unable to access or remove during the manual outreach process. It effectively allows you to ask Google to disregard these links when assessing your website, therefore nullifying them.Using the Disavow Tool is a really important part in trying to get that Manual Action revoked. You can find it within your Webmaster Toolshere. How do you use the tool? What do you do with it? The links that you were unable to remove via manual outreach should be added to a .txt file. In fact, for sites that have been really heavily spammed or which have been engaged in very black hat link building tactics, we often suggest disavowing on a domain level as opposed to on a page/URL level. Each entry on the disavow file should be given its own line, and you can add notes to the file to give top-level details should you so wish. #The following sites have been classed as spammy or low quality links, web directory links and article directory links. #Some domains have not been contacted, as there was no obvious way to reach the webmaster. # website links that need to be disavowed due to websites not being indexed (sign of penalty) or are of low quality. Once you’re happy that all the links and domains that you wish to disavow are included within your file, you can go right ahead and submit it in Webmaster Tools at the page that I showed you earlier. It’s a really quick, easy submission process. Just follow the steps – you can’t go wrong. So what is a recon request? When dealing with a manual penalty, you are able to follow-up your disavow submission with what’s known as a ‘Reconsideration Request’. This is your opportunity to bring further clarity to the Google Spam Team when they review your case. You need to reaffirm the approach that you’ve taken to clean up your act, highlight the fact that no further black hat link building is taking place towards your domain and also provide any helpful supportive data to assist and demonstrate your point. What detail should I include in the reconsideration requests? Summarise the efforts you’ve made to rectify and clean up the link profile. The number of links you identified within your link profile. The number of links you identified that contravene Google’s Webmaster Guidelines. The number of undesirable links you manually removed. The number and dates of manual outreach conducted. Share a link to the manual outreach spreadsheet that you created which states the websites, webmasters, contact dates and success rates. Remember to make sure that this spreadsheet is openly readable by anyone who has the link to it. Sometimes we even include screenshots in a separate tab of the spreadsheet which shows some of the responses that we’ve had from webmasters during the link removal requests. Finish with a paragraph explaining the ways that you are now promoting your website ensuring that you state that it is in no way reliant on previous tactics. State that your team is committed to working within Google guidelines and that this is reflected in not only current digital activity, but also by the extensive efforts that have been made to become inline with Google requirements. How long does it take to hear back from Google as to whether my request has been successful? And is it always successful? Once you’ve completed your reconsideration request, it can be submitted via Webmaster Tools. Don’t expect an immediate response from the spam team – we find that it typically takes anywhere between 2 – 6 weeks for them to respond depending on how busy they are. If you’re successful then congratulations! If not, you’ll have to do further work and potentially improve your disavow file before submitting another recon request.